So versatile, you'll use it every day. 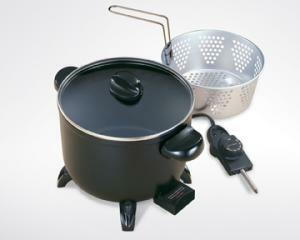 Makes soups and casseroles; steams vegetables and rice; cooks pasta; roasts meat and poultry. Versatile basket included for steaming, blanching, and frying. Accurate cooking temperatures are maintained with the Control Master heat control. Premium nonstick surface, inside and out, for stick-free cooking and easy cleaning.